Peggy Klaus is the author of The Hard Truth About Soft Skills (Collins, 2008) and Brag! The Art of Tooting Your Own Horn Without Blowing It (Warner, 2003). You may have seen Peggy on Nightline, the Today Show, and 20/20 or read her advice in the Wall Street Journal, Fortune, Newsweek, The New York Times, BusinessWeek, and O magazine. You may know her as the “brag lady” or—as one newspaper called her—a “bragologist” because of her popular book, BRAG! The Art of Tooting Your Own Horn Without Blowing It. Or you may know Klaus for the soft skills savvy she promotes in her second tome, The Hard Truth About Soft Skills: Workplace Lessons Smart People Wish They’d Learned Sooner. In today’s highly competitive business world, bragging is a necessity, not a choice. When you remain quiet about yourself or downplay your successes, you will stall or derail your career. In her first best selling book, BRAG! The Art of Tooting Your Own Horn Without Blowing It (Warner Business Books, May 21, 2003), Peggy Klaus introduces the most effective ways to sell your best asset—you— without turning off those you’re trying to impress. Her expert advice will help you overcome common misperceptions around bragging, and teach you how to talk about yourself and your accomplishments with pride and enthusiasm. Based on years of experience showing professionals how to communicate their value and their brand, the strategies outlined BRAG! will benefit everyone from CEOs to associates, entrepreneurs to academics, and any person seeking a job or a promotion. Peggy Klaus—the woman who busted bragging myths and made us rethink self-promotion with BRAG! The Art of Tooting Your Own Horn Without Blowing It—brings us The Hard Truth About Soft Skills—Workplace Lessons Smart People Wish They’d Learned Sooner (Collins, February 1, 2008). In her second best seller, Klaus reveals why soft skills are often ignored and why you can’t afford to ignore them any longer. Throughout the book, she distills 54 important workplace lessons based on stories of struggle and triumph collected over thousands of hours coaching, training and interviewing executives from the C-suite on down the corporate ladder. The Hard Truth About Soft Skills—Workplace Lessons Smart People Wish They’d Learned Sooner, will give you practical insights, strategies, tools, and techniques for improving a variety of soft skills critical to career success. The lessons are organized into eight chapters, each covering those core competencies that play a significant role in your job: career management, getting the job done, communication, handling critics, office politics, self-promotion, dealing with differences, and leadership. Adapted from BRAG! 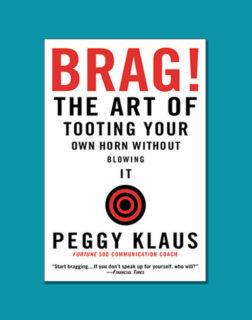 The Art of Tooting Your Own Horn Without Blowing It by Peggy Klaus, Warner Books, ©2007 Klaus and Associates. By answering the “Take 12” questionnaire, you’ll have the beginnings of what Peggy calls your “Brag Bag,” a colorful collection of personal and professional information that you can use to create your bragologue—a brief, pithy, conversational monologue that talks about you (what you do, your accomplishments, etc.). Bragologues can range from a ten-second “elevator pitch” to a one-minute introduction at a networking event, a client pitch, or a cocktail party, just to name a few. Whatever the situation, your bragologue should be memorable, entertaining and make the listener eager to hear more. Once you’ve taken the BRAG! quiz and written your bragologue, practice it out loud so you sound conversational and spontaneous, not memorized or canned. Make sure you tweak your bragologues for different audiences-no one size fits all- and add new “brag bites” as needed.